One of her Kirsty Wallett’s first memories as a child is riding in the back seat of a hot rod. She remembers working with her dad in the garage, and so her passion for classic cars was passed from father to daughter. But initially Kirsty didn’t embrace her vintage love. You know what those awkward teenage years are like. You just want to fit in and dressing rockabilly was not a way to look like everyone else. But that melted away and these days Kirsty is all about embracing a modern vintage life. And her love of cars has never gone anywhere. Travelling around Australia to attend vintage car and hot rod festivals and through that she found her way into pinup. Competing, judging, becoming involved in running and planning events. It’s the history of the scene, the items she collects, the car she drives that draws Kirsty in further. And fashion wise loves the Rockabilly look but has recently started dipping her toe into the 1960’s scene! 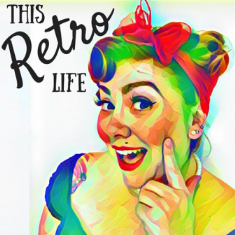 In between her own vintage passion, Kirsty tells stories of others through her online magazine Retro Betty .